I dislike  Music. I dislike all streaming services. I want to buy and own tracks. I can se that i'm a minority. The music app on iPhone has been getting worse and worse with each new iOS version. Are there any positive changes in iOS 11 for users who prefeer NOT to use  Music? A basic function I miss every day, is the ability to list all songs from all albums from one artist*. Is that possible in iOS 11? i just wish you wouldn’t need a need a credit card to start a free trial. I haven't installed the beta, so I do not know if iOS 11 is different/better/worse. However, you can do that in iOS 10. Hit the Search button on the bottom, change the search to "My library", and type the artist name. It'll show a listing for artist, Albums, but then also Songs. Last edited by Spencerdl; 06-11-2017 at 10:31 AM. Tartarus, TheRandomDealio, joemd60 and 1 others like this. What I mean is that the Music app on iPhone is getting worse for people who prefer to not subscribe to  Music. I'm having trouble seeing this as anything other than a fact, but if you are already a Music user*, and like that experience, its probably not easy to see this the same way. Apple is trying to "persuade" people to pay for  Music. I dont have particularly spesialized needs or demands, I just think that they (Apple) are obviously softly "crippling" non- Music use of the Music app. Removing Genius and removing certain music-browsing alternatives from the app. I have been using Apple products since 1990, and love my iMac, iPhone, iPad, tv etc. Also i miss the Genius feature... still gone in iOS 11? If the songs you have downloaded are well-organized and have their album, song title and artist name present in the music file itself, they can be listed by them. But, if the songs you have imported come from “other” sources than the official way, they can have all sorts of id3 tags present that prevent the sorting feature from working. I disagree, the Apple App Store has made a lot of money on many apps that found a solution including music apps. Tartarus and joemd60 like this. What I mean is that the Music app on iPhone is getting worse for people who prefer to not subscribe to ï£¿ Music. I'm having trouble seeing this as anything other than a fact, but if you are already a ï£¿Music user*, and like that experience, its probably not easy to see this the same way. Apple is trying to "persuade" people to pay for ï£¿ Music. I dont have particularly spesialized needs or demands, I just think that they (Apple) are obviously softly "crippling" non-ï£¿ Music use of the Music app. Removing Genius and removing certain music-browsing alternatives from the app. I have been using Apple products since 1990, and love my iMac, iPhone, iPad, ï£¿tv etc. According to your post I see you're invested in the Apple ecosystem. Have you thought about introduction to the iMore members. We actually have an introduction thread for new comers. The tags in my collection are perfectly fine. I really enjoyed the music app back when it had albums in cover flow view. It’s a little different, but if you go to Artist in the Music app, find the artist you want, tap on it and you’ll see her/his albums. Tap the album and you’ll see all songs. 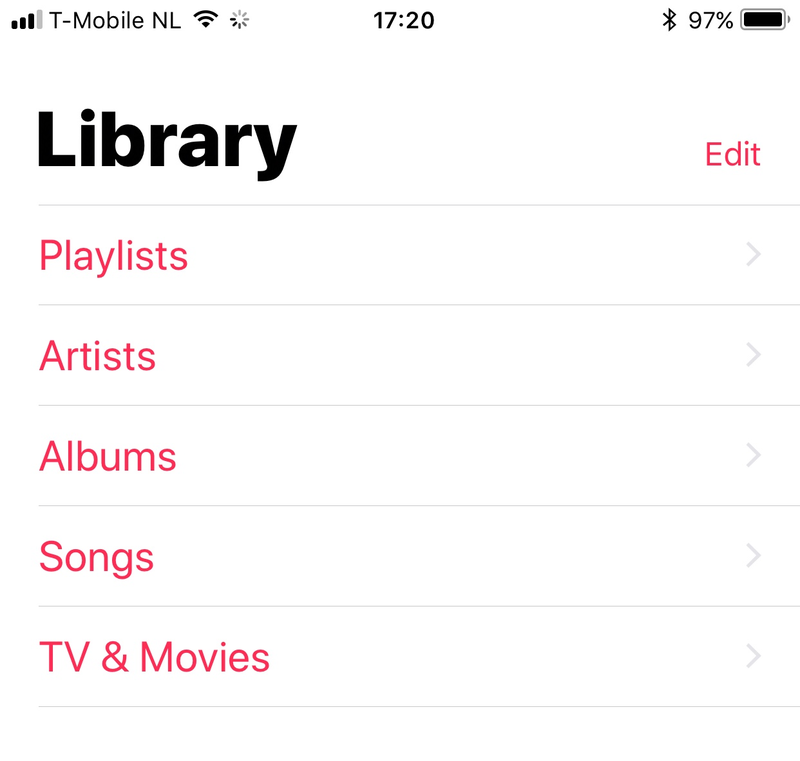 Also, you can go to Songs in that overview and sort all songs by Artist, they automatically get sorted by album. I like Static Player also. I prefer to own my music as well. Between Amazon and Apple which is where I buy my music, depending who is cheapest, or has what I want. Being a Prime member, Amazon is my go to for streaming. And there is in my opinion, nothing wrong with the Amazon music app on IOS. Edit: I have tried Apple Music, Amazon Music Unlimited, and Spotify Premium. In the end, despite being a Prime member. I opted for Spotify Premium. The curated playlists, the UI, ease of use,and other features of the service, IMHO has the edge over the other two. Last edited by joemd60; 05-06-2018 at 07:00 PM. I believe the only function that may be missing is the genius feature. But even with that it still gives you playlist based on your liking. I personally prefer Apple above all streaming apps. By Mhazell1989 in forum New to the Forums? Introduce Yourself Here!